The stubbornness and grit of a podiatrist, a general surgeon and a patient helped alter Larry Babel’s original prognosis of a leg amputation. In July 2016, Larry Babel visited Denver, Colorado for a sporting event. A couple of days after he returned home to Cincinnati, he found a strange blister on the side of his foot. His podiatrist, Michael Kiehl, DPM, referred him to Fairfield Hospital’s Wound Care Center when antibiotics did not heal the ulcer. This case was particularly challenging because the same foot had surgery in June 2016. The bones were infected and Larry was a diabetic. Diabetics tend to have restricted circulation, especially in their lower limbs. This places them at extra risk for developing skin injuries that leave them vulnerable to cellulitis, a common skin infection. People typically contract cellulitis when bacteria such as streptococcus and staphylococcus enter the body through a break in the skin. Cellulitis can spread to the lymph nodes and bloodstream and is potentially life-threatening if left untreated. Larry saw at least two other podiatrists, and they recommended having a leg amputation below the knee. Larry, however, was insistent on avoiding the amputation and asked for a second opinion. 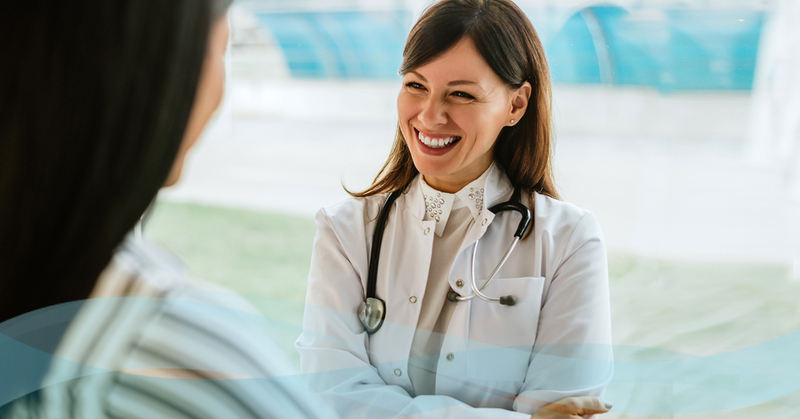 That’s when he met Mercy Health Physician and General Surgeon James Fitzpatrick, IV, MD at Mercy Health – Fairfield Hospital. Dr. Fitzpatrick agreed to do everything he could to heal Larry’s foot so he would not require an amputation. Dr. Fitzpatrick began working in conjunction with Dr. Kiehl, and they started hyperbaric oxygen therapy in October 2017. During these procedures, Larry’s body received pressurized, 100 percent oxygen in an attempt to speed the healing process. Larry also continued his antibiotics, and Dr. Fitzpatrick and Dr. Kiehl added skin substitutes, which are bio-engineered products —similar to skin grafts — that provide the correct environment for critical wound healing. Still, the ulcer would not go away. Several specialists performed multi-modal surgeries and new challenges arose. Larry contracted acute appendicitis and he needed his appendix removed. He later complained about left knee pain and ended up having an entire knee replacement, too. Dr. Fitzpatrick, Dr. Kiehl and Larry circled back to the foot surgery Larry had in 2016 and they assumed a metal plate inserted in his foot for a facture was hosting bacteria. A surgeon removed the plate and Larry lost a toe and metatarsal bone in the process. It turned out to be the right thing to do. “After removing the plate, everything started getting better right away,” says Larry. 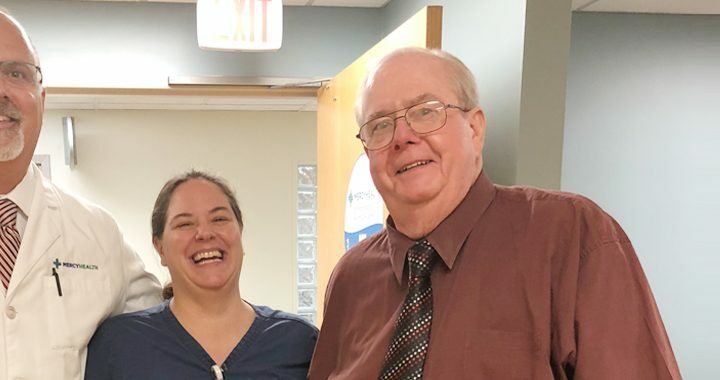 Eighteen months after discovering his blister, Larry’s foot was fully healed and Dr. Fitzpatrick released him from his care in December 2017. Larry also spoke highly of Dr. Fitzpatrick and his care team. Today, Larry, who is 67 and has three grown children, two sons and a daughter, spends his Sundays chasing his six grandchildren. “They drive me nuts,” he says laughing, knowing that things could have been much different. For more inspiring patient stories, read about a cerebral aneurysm recovery and knowing the signs of a heart attack. 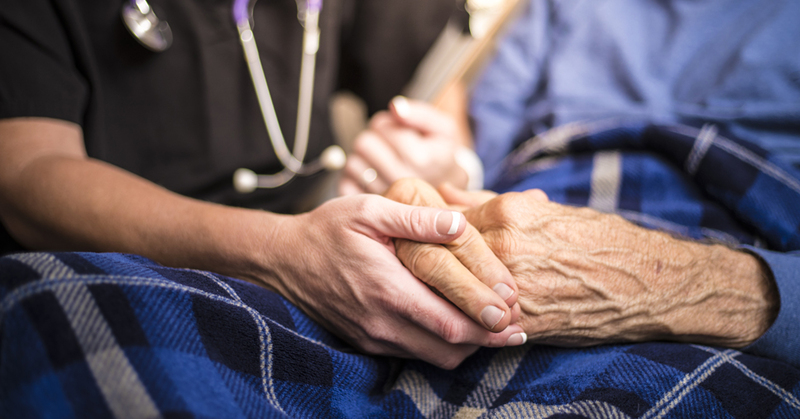 Hospice and Palliative Care: What’s the Difference? Sign up to receive weekly updates from us packed with healthy news, tips, research, recipes, and more – right to your inbox! Sign up to receive regularly scheduled updates from us packed with healthy news, tips, research, recipes, and more – right to your inbox!